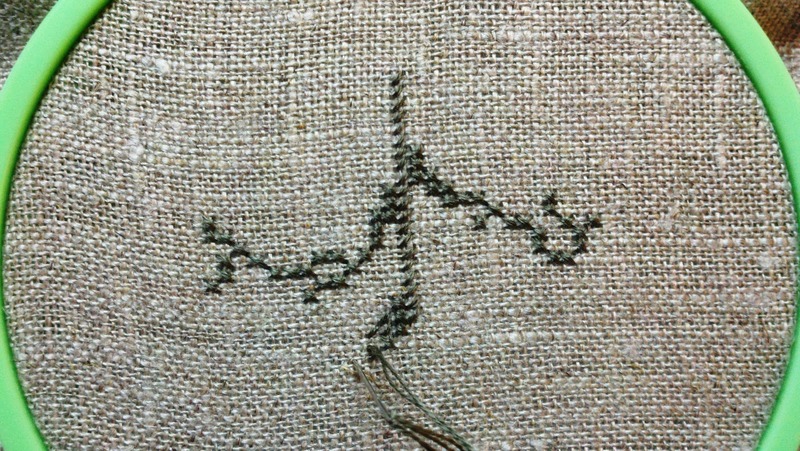 I'm attempting my first stitching on linen!! I love how finished projects look when they're done on linen, but the material itself has always scared me. I have trouble getting all the counts right using aida cloth, how could I expect to get anything done using linen? :) I've played around with linen before, just to see what it was like and it felt too difficult for me, so this is my first official "project" using the pretty material. It feels like it took me an hour just to finish that much!!! I've even had to frog a little, already!!! <sigh> But, I am loving how it's looking, so I'm determined to see it through!! The pattern called for 36 count, but I decided to start slow, so I'm using 28 count (it feels like 500 count!!). 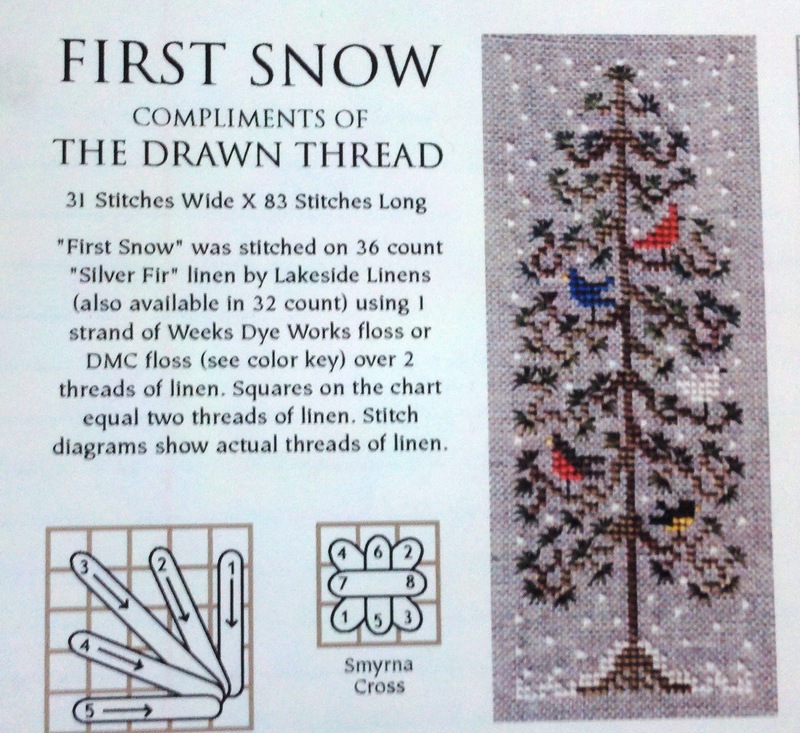 The pattern design is from The Drawn Thread and you can download it for free here. Wow! 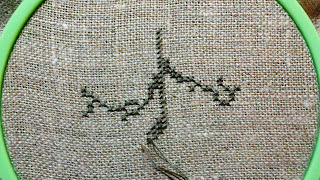 Your doing a wonderful job with stitching your first time on linen. You will find that once you get it. 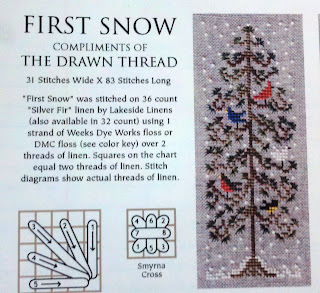 You will be stitching just as fast as you did without linen. I learned to stitch on linen a few years ago. I love it. Now, if I do get the hang of it, it opens up the door to so many pretty choices for material, which is the bright side....the not so bright side is I might need to get some bifocals or something to see these holes!! Best wishes and happy stitching to you. Your linen start looks great. Keep at it, soon it will be easy and you will wonder what all the fuss was about! I remember my first projects on linen and thought I'd never get the counting straight! Your next project you might try Monaco. It is a little stiffer like aida and the threads are more even than true linens, makes for a bit easier time. Daffycat - Welcome! Thank you so much for joining my blog! I have never heard of Monaco before, I'm definitely looking into it. I had no idea there was anything but aida and linen....this opens up more possibilities for me!! Looking really good! I haven't been brave enought to try anything other than aida just yet, but I'm thinking about it for the next project I have lined up. You'll have to bring this one over so I can see it when it's done! I just finished the piece off today, I'll post pictures in a bit. I have some linen left over, I'll bring it out to you so you can experiment like I did!